In 2013 the Laing brothers of Douglas Laing & Co Ltd - Fred and Stewart - went their separate ways, with Fred continuing the Douglas Laing side of the business. 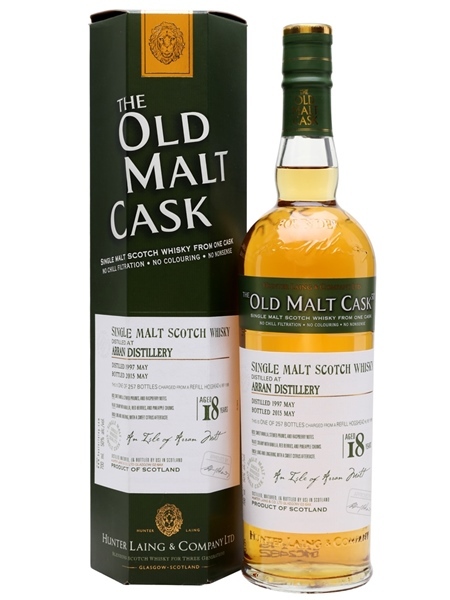 Stewart went on to form Hunter Laing & Co Ltd and amongst the established brands he took with him was the Old Malt Cask brand, established in 1998. The Arran distillery is the only distillery on the Isle of Arran. It's relatively new, established in 1995, so only operational 2 years when this expression was distilled and laid down for 18 years of maturation. As is tradition with the Old Malt Cask range, this expression is non-chill filtered and bottled at 50% ABV in a run of 257 bottles.